Oggi il team di KDE ha rilasciato KDE 4.10 Beta 2. Grazie ai feedback ricevuti con la precedente beta si è potuto apportare significativi miglioramenti al sistema sotto il profilo correzioni bug e stabilità. Qt Quick in Plasma Workspaces -- Qt Quick is continuing to make its way into the Plasma Workspaces. Plasma Quick, KDE's extensions on top of QtQuick allow deeper integration with the system and more powerful apps and Plasma components. Plasma Containments can now be written in QtQuick. Various Plasma widgets have been rewritten in QtQuick, notably the system tray, pager, notifications, lock & logout, weather and weather station, comic strip and calculator plasmoids. Many performance, quality and usability improvements make Plasma Desktop and Netbook workspaces easier to use. 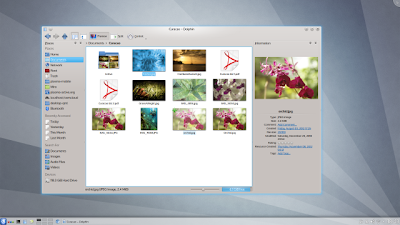 New Screen Locker -- A new screen locking mechanism based on QtQuick brings more flexibility and security to Plasma Desktop. Animated Wallpapers -- Thanks to a new QtQuick-based wallpaper engine, animated wallpapers are now much easier to create. Improved Zooming in Okular -- A technique called tiled rendering allows Okular to zoom in much further while reducing memory consumption. Okular Active, the touch-friendly version of the powerful document reader is now part of KDE SC. Faster indexing -- Improvements in the Nepomuk semantic engine allow faster indexing of files. The new Tags kioslave allows users to browse their files by tags in any KDE-powered application. Color Correction -- Gwenview, KDE's smart image viewer and Plasma's window manager now support color correction and can be adjusted to the color profile of different monitors, allowing for more natural representation of photos and graphics. Notifications -- Plasma's notifications are now rendered using QtQuick, notifications themselves, especially concerning power management have been cleaned up. New Print Manager -- Setup of printers and monitoring jobs was improved thanks to a new implementation of the Print Manager. Kate, KDE's Advanced Text Editor received multiple improvements regarding user feedback. It is now extensible using Python plugins. KTouch -- KDE's touch-typing learning utility has been rewritten and features a cleaner, more elegant user interface. libkdegames improvements -- Many parts of libkdegames have been rewritten, porting instructions for 3rd party developers are available. KSudoku now allows printing puzzles. KJumpingCube has seen a large number of improvements making the game more enjoyable.